Well our time has run out in this fair country. As we depart we are stopping into the Cinque Terre for a wee visit. 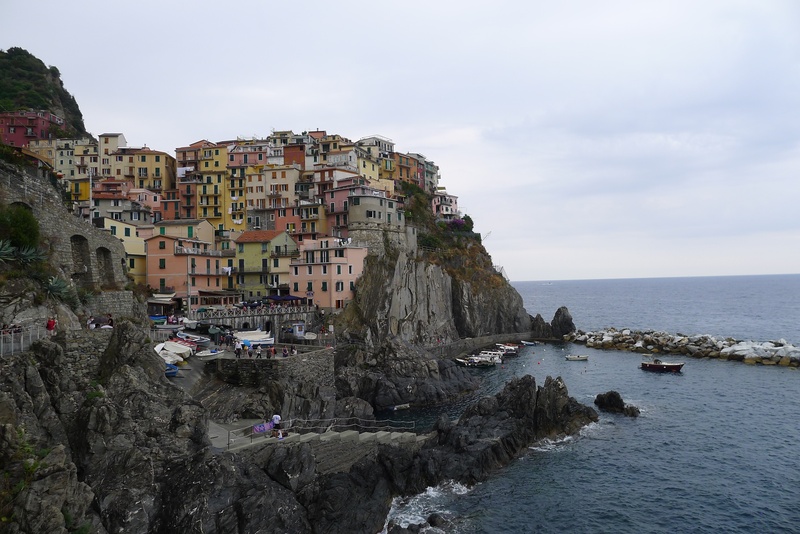 We have our sites set on Manarola. Chris saw a picture of it on the cover of an Italian travel guide and so this has made the decision rather easy. For those of you who are unfamiliar, the Cinque Terre is probably one of the most photographed areas of Italy. It is a series of 5 villages along the coast. In terms of photo ops, it is akin to those pastel coloured row houses in San Francisco. 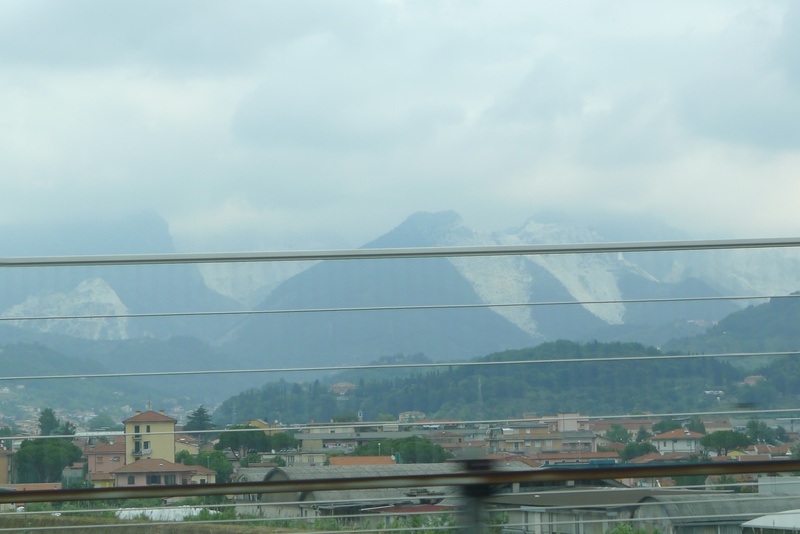 These are the mountains – unfortunately we are driving highway speed, but what you are looking at are four mountains that have had massive chunks cut out of them. Have you ever wondered where all of this marble comes from? I have. I was astonished to see that in time, it it possible that these mountains will literally be cut away. Today isn’t particularly sunny which to be honest I am relieved by. These high 30C days make exploring less than ideal for me. I don’t operate that well when the heat is pushing 100. What’s incredible about this landscape are the sheer drops – the drive is not for the faint of heart. The people here are tenacious – grapes are planted on practically vertical terraces that are harvested with a ‘tractor’, which is a seat for someone to sit on and a series of crates behind it to store the grapes in, all pulled upward on a pulley. You could not pay me any amount of money to do that. It is absolutely terrifying to look at. (I think I was so awed by this spectacle that I didn’t think to take a picture). 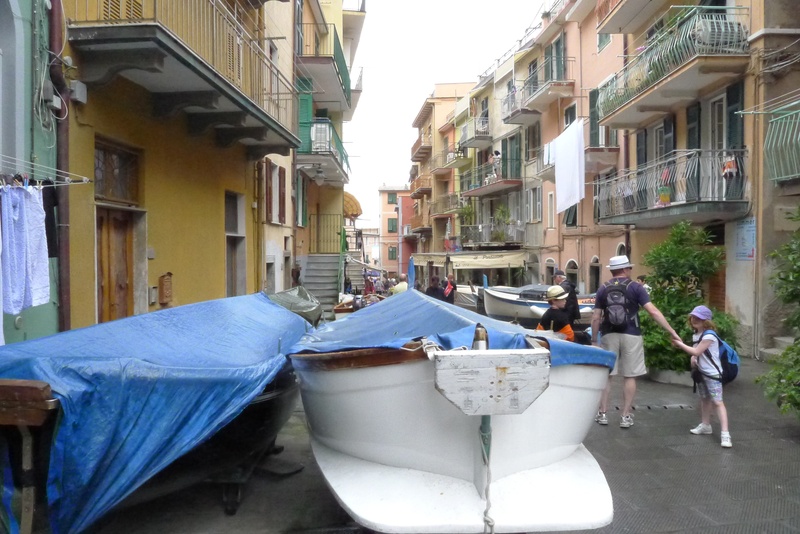 Down in the village of manarola, the citizens park their boats here like most people park their cars: in front of their houses.